‘Bobeche et Galimafré’ by Juliano, published by O. Legouix, Paris in 1859 and illustrated by Antoine Barbizet. 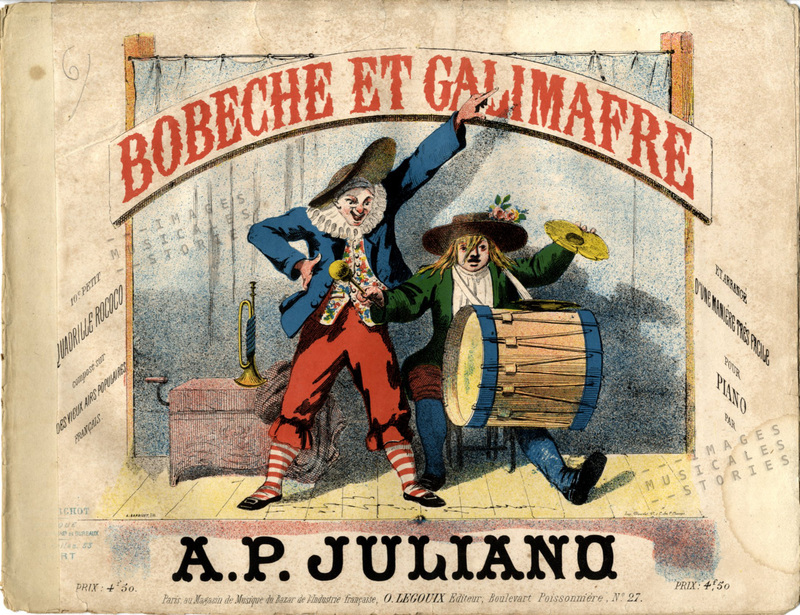 This cover shows two Parisian buffoons: Bobèche and Galimafré. It was illustrated by Barbizet in 1859. Even forty years after their successful performances, the pair remained popular in Paris. Bobèche (Antoine Mandelot) and Galimafré (Auguste Guérin) were paradistes or clowns who performed at the Boulevard du Temple in the first quarter of the 19th century. At that time the Boulevard du Temple resembled a pleasure garden. It was lined with theatres. Scattered over the vast expanse of the boulevard were a host of small shows: jugglers, paradistes, monkey showmen, dwarves, giants, skeleton men, strongmen, tightrope walkers and fortune tellers. They attracted a crowd day and night. In the middle, street vendors tried to sell their ware. A typical street vendor at the Boulevard du Temple was the marchand de coco. You can see one standing on the right of the print above. Coco was a lemonade containing liquorice extract. A coco vendor always wore a white apron and carried a large elongated container topped with a figurine to attract attention. He had several drinking cups strapped onto belts. 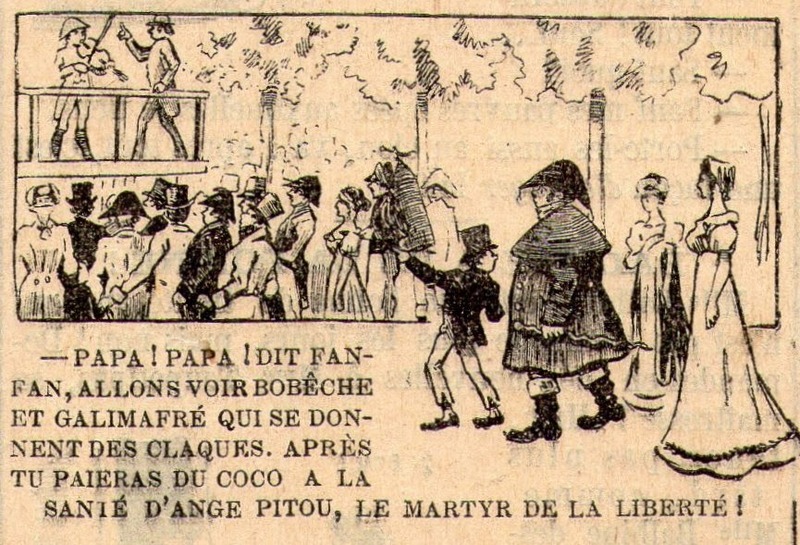 We also see a coco vendor standing in the public at the buffoons’ show, depicted in this cartoon. 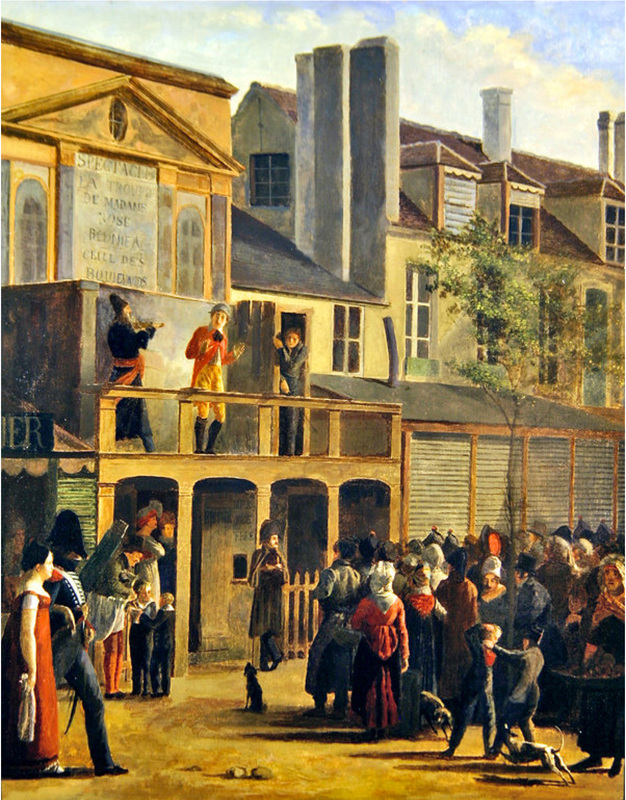 A contemporary oil painting also shows the acclaimed theatre performance by Bobèche and Galimafré. Can you pick out the obligatory coco vendor? The Parisians nicknamed the Boulevard du Temple ‘Boulevard du Crime’, not because it was dangerous but to allude to the bloody melodramas playing in its theatres. An artistic impression of the Boulevard du Temple (1862). A panoramic painting of the Boulevard du Temple illustrates the extent of the street. Have you spotted our coco man in this crowd? In the year this was painted (1862), almost all of it would be demolished by Baron Haussmann in order to enlarge the Place de la République during the rebuilding of Paris. The Boulevard du Temple has been rebuilt in the studio for the legendary film Les Enfants du Paradis. 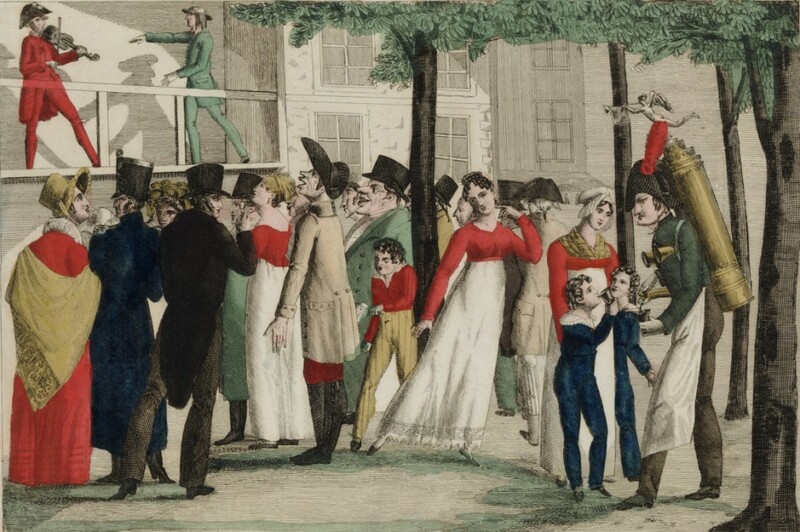 In the fragment we see Baptiste Debureau (Jean-Louis Barrault) trying to get to Garance (Arletty) during carnival. But let’s get back to Bobèche and Galimafré. As told before they were paradistes. A parade is a type of French street entertainment dating back to the renaissance with characters often drawn from the commedia dell’arte. In the first quarter of the 19th century it was a short improvisational buffoonery performed by two or three characters on a balcony outside the smaller theatres, or on outdoor platforms. The sketch was larded with crude humour, vulgarities, double entendres, sexual innuendos and obscene gestures. Slaps and punches enlivened the spectacle. Bobêche and Galimafré were the best-loved parade characters of this period. They always presented their jokes in the form of dialogues. 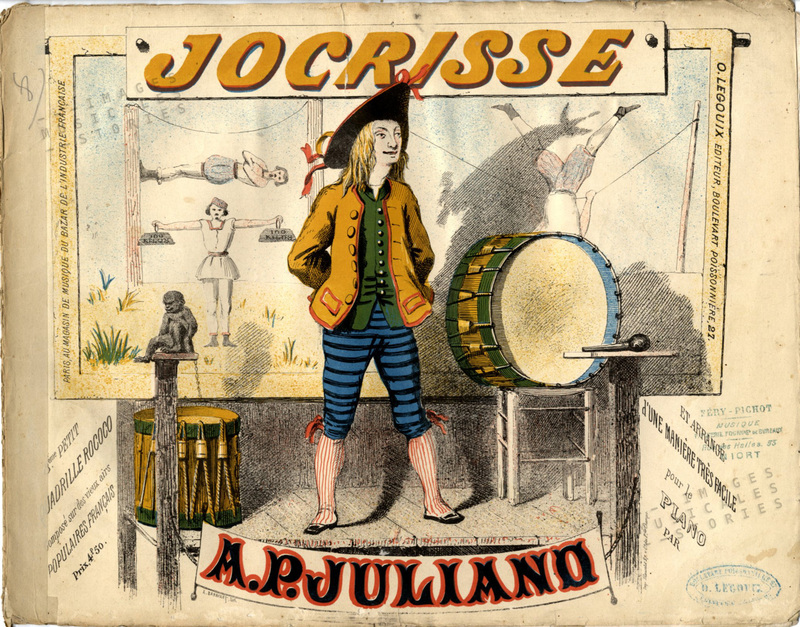 Jocrisse, by Juliano, published by O. Legouix, Paris in 1859 and illustrated by Antoine Barbizet. Bobèche played the standard comedic character of a Jocrisse, the incarnation of stupidity and clumsiness. Bobèche was a city boy who wore colourful clothes, striped stockings and a cornered hat topped with a butterfly. Galimafré would attract the crowd with a giant rattle. He was a tall lanky man, dressed in the costume of a Norman peasant. His wig’s hair was cut straight across the forehead. On top of that he wore a kind of bowler hat. During twenty-some years Bobèche and Galimafré performed on the Boulevard du Temple but also in private salons. The fall of Napoleon also meant the end of the popular duo. Galimafré refused to perform for the ‘enemy’ and worked as a stage technician for the rest of his life. Bobèche became director of a small theatre in Rouen. But soon his theatre went bankrupt and nothing was heard of him since. Dat Vlaanderen is toch een enorm rijk land, daar steekt Nederland toch armoedig bij af ! Waar halen jullie dat moois vandaan ?